Oh boy, you fell right into it! Don't you see, the pink is a "transcendent" color. Of course you can't see it, because you're still flesh and blood in this fallen world. Etc etc. The same kinds of arguments are used in serious theology all the time. And that's the whole point of that meme. I'm sure you can do better if you try one more time. No, I didn't. The concept of transcendence has nothing to do with the visible aspect of color. You may as well say that pink is a more observant colr than yellow. Just stringing words together does not make an argument. It only proves my point that there is no real thought behind the meme. Now you sound just like an atheist arguing against religion. 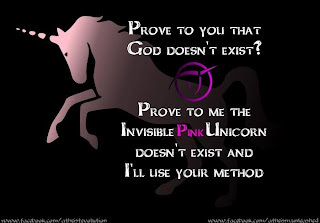 So now I'll take the standard theological stance: "You totally misunderstand the concept of the invisible pink unicorn. Your concept of color is too simplistic. As Jaroslav the Incoherent wrote in his commentary on unicornism, 'I see not with mine own eyes, but the pink is within my heart.' (Canto XVII) Until you read Jaroslav, you'll never be able to argue meaningfully about the Invisible Pink Unicorn, bless His holy name." No, John, you are completely missing the point. I offered a deductive argument, with premises and a conclusion that naturally follows. You cannot offer random assertions, you must create an *argument*. Remember, the meme says "I will use YOUR method." So, you must make a sound argument. As I mentioned and linked above, a sound argument must be able to support its premises and not just assert them. See the link http://www.iep.utm.edu/val-snd/ for more on what I did. Creating quotes from imaginary people proves that you don't know what you're talking about. Christians don't make up imaginary quotes, they quote from real scholars. People like Anselm, Aquinas, and Augustine really lived and even the most secular institutions must teach them because they were truly brilliant men who advanced western thinking. That's my method. Where's yours? There are atheists who have strong arguments against God's existence, but the invisible pink unicorn meme is nowhere near that. Making up statements on the spot just highlights how ignorant you are of the real scholarship that exists. Sure, Anselm, Aquinas and Augustine were real people who wrote with ink on some sort of paper, but they ultimately pulled their ideas out of thin air, just as I did with Jaroslav the Incoherent. And sure, those real philosophers dressed up their ideas with complicated Greek-style logic, but it's all based on unsupported assumptions. For example, they just assumed there must be a first cause, or that a thing which does not exist only begins to exist by something already existing. This is just as random as the pinkness of the invisible pink unicorn. I'm amused because the meme is making fun of that kind of tortured logic, and you're just responding with more tortured logic. Really? Philosophers pull their ideas out of thin air? Mr. Moore didn't pull his idea out of thin air. He created Jaroslav and Unicornism based on what he knew of someone else's created challenge- unlike the aforementioned philosophers who made these "assumptions" based largely on what they knew of an actual historic figure, who claimed to be the embodiment of that "first cause". I think that that's pretty good support. And wait, don't atheists/evolutionist assume their own first cause? Something came from something that already existed but doesn't seem to have a creator? Don't they call it the "big bang" theory? You are the subject of an experiment. You are blindfolded. You are told that a chair has been placed behind you for you to sit in. You feel behind you for the chair and sit down. Your blindfold is removed. The room you are in is pitch black. What color is the chair? You can't see anything. The chair is invisible to you. The lights are turned on. You can now see that the chair is pink. The chair is both invisible and pink. Color is a visual perception. Your argument might work on the Transparent Pink Unicorn. Peace. You need to read the meme again. It makes no such distinction. 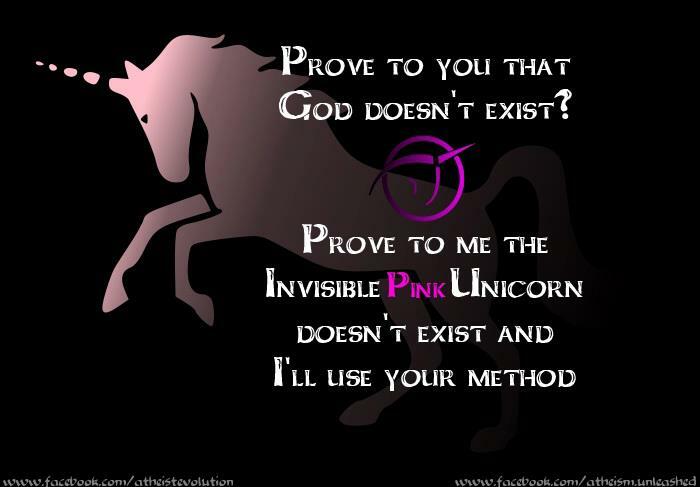 the whole point of the meme is that you can't prove that god doesn't exist, it doesn't actually have anything to do with pink unicorns. obviously the meme isn't well done because you proved that invisible pink unicorns can't exist (or maybe you didn't, i couldn't be bothered to actually read that part), but the message would be the same if i said 'prove to me that there isn't a magical troll who can't be seen by humans and ill use your method. who also thinks gays should be stoned to death.' and if you did somehow prove it doesn't exist, although I'm pretty sure you can't, i could make up a bunch of rules about Yaga (the magical troll) to disprove you're theory. and if you disproved those, i could just say that the previous rules were wrong and i was misinformed (genesis saying that the earth is flat + other). Since I am but a simple man, all that I have gleaned from this discussion is that debating the law of non-contradiction with illogical and irrational beings is a colossal waste of time. Make a truth table without the color pink: The invisible unicorn is invisible. Now substitute with, the invisible God is now invisible. The point then is that invisibility is not the same thing as non-existence. yeah, I noticed that the theist's argument against the existence of invisible pink unicorns is sound because it incorporates a color in it which contradicts the invisible property. But what if there wasn't a color? How would you disprove an invisible unicorn? I don't think you can and it begins to reflect Carl Sagan's Heatless Invisible Garage Dragon example. The difference however would be that there is no evidence supporting the existence of said invisible unicorn or invisible garage dragon, but there is overwhelming evidence supporting the existence of a Deistic God and especially Jesus of Nazareth. You are right Lenny. Both accept the use of the terms. Atheists must accept the term of God and His attributes from a theist. In that sense, the atheist borrows from the theist, else there is no contest. The proposal places the theist in an advantageous position. Your argument is based on a false premise. Pink is not a visible color. Pink Power exists yet its not of any visible color. Have you ever seen a pink dollar that is pink to your eyes. So things can be Pink yet not visible to the eyes. Like our Lord the Invisible Pink Unicorn.